It's one of the great pop injustices of the year that Foster The People's plodding (if catchy) 'Pumped Up Kicks' can be heard coming from every single radio and television in the UK, where fellow LA residents Grouplove and their excellently giddy 'Colours' remains a hit only amongst the listeners of 6Music. This says much more about the general singles purchasing population than it does about Grouplove. Beginning very well (with handclaps) 'Itching On A Photograph' kicks off the record, and instantly it's obvious what we're dealing with. 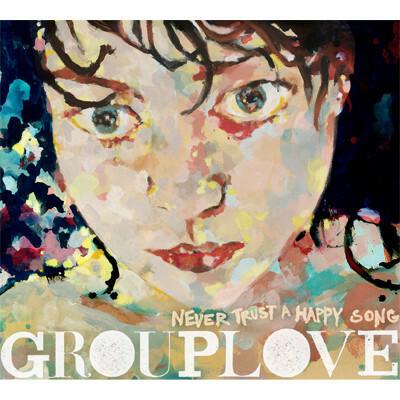 Grouplove deal in big pop tunes with everything-and-the-kitchen sink thrown in. Jangly guitars, semi-wild vocals, multiple-part harmonies and the sort of massive sounding drums that make you want to throw shapes around the sticky dancefloor. Despite any allusions to mid-decade mainstream indiepop it's genuinely exciting and when paired with current radio single 'Tongue Tied' forms an unbeatable opening pair. With a (Hot Fuss era) Killers-eqsue bassline it sounds like a proper hit. The underpinning synthesisers bring a different element to Grouplove's sonic pallet than we witnessed on their first recordings resulting in an amalgamation of MGMT cool and Black Kids exuberance. Every time this comes on it's impossible to resist the urge to pogo like a loon. You've been warned. 'Lovely' cup suffers from some lyrics that are bound to grate on some people (“You're such a lovely cup / Why don't you fill me up”) but as it fronts a tune that's in the vain of R.E.M. 's Green there's every chance that you can let it slide. Plus it exists between 'Tongue Tied' and 'Colours', the latter of which is easily one of the best singles of the year. It's just sheer brilliance! I mean will you just clock the drumming on that. It's track four on what's as strong an opening salvo as you're likely to hear on a pop album this year. Midway 'Naked Kids' makes a surprising return from the EP/mini-album. With a more slacker vibe it sits in much better than expected, slowing the pace and giving some breathing room. As much as it smacks of privilege (“Cruising on the highway with my friends, top down / And we're all on our way to the beach”) there's an element to the delivery that suggests a more subversive undercurrent. Be it a mockery of the rich kids or a comment on the 'missing generation' that have no work to go to either way it's alright by these ears and British class-conscious sensibilities. Elsewhere Grouplove show off their versatility with this pop malarkey. 'Slow', with it's looser structure, swirling keyboards and backing vocalist Hannah Hooper taking the lead, feels more like an interlude than full blown single and 'Cruel And Beautiful World' is their country number. Well, obviously it's not country in the modern day, tacky Nashville, dress up sense, but rather a foot-tapper that's lead by some neat twanging guitar and Hooper and (front man) Christian Zucconi's joint vocals. Further variety is added by 'Spun' which features a drastically different vocal style. It's been described as their radio rock hit with good reason. Plus it's a little bit shouty. Perhaps 'Betty's A Bombshell' and 'Love Will Save Your Soul' are fillers, but Grouplove are still a young band. So whilst Never Trust A Happy Song isn't a great album it's at least two thirds of the way there. An emotional counterpoint to the anthemic pop tunes (perhaps the swooning 'Get Giddy' from the aforementioned EP) would have proved the simple push it needed. As it stands Grouplove's debut is simply great fun and a sure-fire hit with discerning indie fans who still like a good old dancefloor filler. It's just that there's occasionally the nagging feeling that this album is meant to have only a transitionary impact on it's audience but when the sugar rushes are this great then we need not worry about our long term dental health.